Recent years have brought a growing historiographical interest in the history of facial hair. A number of studies of the early modern period in particular have demonstrated the close links between facial hair and prevailing ideas about masculinity and the male body, as well as the symbolic relationship between beards and virility. Studies of the nineteenth-century ‘beard movement’ have also explored the adoption of the beard as a self-conscious reaction to changing material and industrial conditions by Victorian men, as well as an aspirational symbol for those wishing to emulate new military heroes. As such, facial hair has come to be understood simultaneously as a biological and morphological reality, and a cultural artefact. 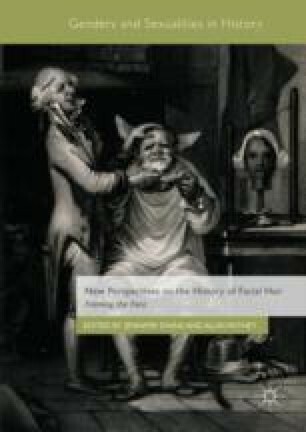 This introduction provides an overview of this existing literature and sets out the scope and central themes of the following volume, which brings together a range of new, multi-disciplinary approaches to the history of beards, moustaches and whiskers. It reveals that chapters in the collection make significant contributions to the field, offering new perspectives on male and female facial hair.